Cocoons form to protect eggs and larvae, but they can also help preserve fossils for hundreds of millions of years. This 25-micrometer-long protozoan was trapped in the wall of an egg case produced by a leech between 200 million and 215 million years ago, during the Triassic Period. The scientists published their findings in the journal Proceedings of the National Academy of Sciences. This relic, with its coiled stalk and large, horseshoe-shaped nucleus is reminiscent of the modern-day Vorticella, a genus of protozoa. Vorticella have stalked, inverted bell-shaped ciliates that are placed among the peritrichs. Each cell has a separate stack anchored onto the substrate that contains a myoneme, a contractile fibril. Once stimulated, it shortens, causing the stalk to coil like a spring. Many Vorticella species live in freshwater ponds and streams. The specimen is unknown in the fossil record. 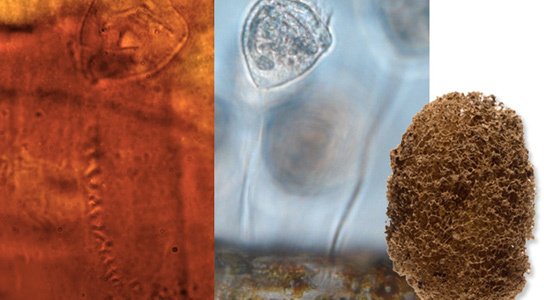 Soft-bodied organisms, like protozoans, aren’t usually well preserved as fossils. Egg casings of leeches and their kin are another matter. The walls quickly harden from a protein and sugar rich mucus secreted by invertebrates. This egg, produced by Hirudo medicinalis, the medicinal leech, can trap soft-bodied organisms that would quickly degrade. Although a few teams have previously described small fossils stemming from spores and microorganisms entombed in egg cases, the cocoons have been largely ignored by paleontologists and could source as a source of microbial fossils. Be the first to comment on "Triassic-Period Protozoan Preserved in Cocoon for Over 200 Million Years"